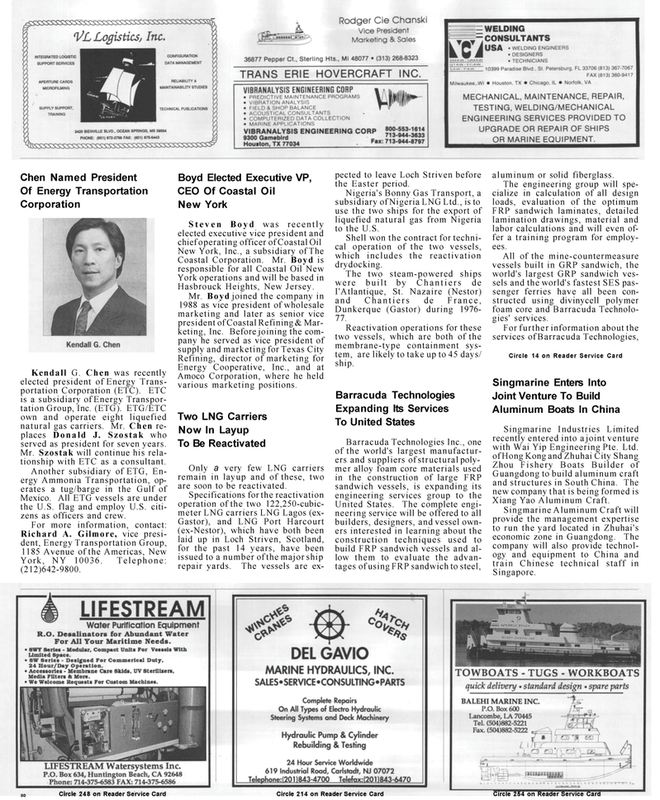 Kendall G. Chen was recently elected president of Energy Trans- portation Corporation (ETC). ETC is a subsidiary of Energy Transpor- tation Group, Inc. (ETG). ETG/ETC own and operate eight liquefied natural gas carriers. Mr. Chen re- places Donald J. Szostak who served as president for seven years. Mr. Szostak will continue his rela- tionship with ETC as a consultant. Mexico. All ETG vessels are under the U.S. flag and employ U.S. citi- zens as officers and crew. York, NY 10036. Telephone: (212)642-9800. Amoco Corporation, where he held various marketing positions. Gastor), and LNG Port Harcourt (ex-Nestor), which have both been laid up in Loch Striven, Scotland, for the past 14 years, have been issued to a number of the major ship repair yards. The vessels are ex- pected to leave Loch Striven before the Easter period. Shell won the contract for techni- cal operation of the two vessels, which includes the reactivation drydocking. Dunkerque (Gastor) during 1976- 77. Reactivation operations for these two vessels, which are both of the membrane-type containment sys- tem, are likely to take up to 45 days/ ship. United States. The complete engi- neering service will be offered to all builders, designers, and vessel own- ers interested in learning about the construction techniques used to build FRP sandwich vessels and al- low them to evaluate the advan- tages of using FRP sandwich to steel, aluminum or solid fiberglass. FRP sandwich laminates, detailed lamination drawings, material and labor calculations and will even of- fer a training program for employ- ees. All of the mine-countermeasure vessels built in GRP sandwich, the world's largest GRP sandwich ves- sels and the world's fastest SES pas- senger ferries have all been con- structed using divinycell polymer foam core and Barracuda Technolo- gies' services.